Did you know that the largest concentration of art deco buildings in the world is to be found right here in Miami Beach’s Art Deco Architectural Historic District in South Beach? 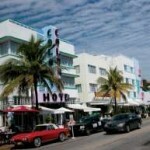 You can learn more about them on the Art Deco Walking Tours put on by the Miami Design Preservation League. You can take a guided tour, or go at your own pace on the self-guided tours. For the self-guided tours you’re loaned an iPod so you can listen as you walk. Commentary is available in English, Spanish, French and German. This entry was posted on Wednesday, March 24th, 2010 at 5:22 am	and is filed under 365 Things To Do In Miami. You can follow any responses to this entry through the RSS 2.0 feed. Both comments and pings are currently closed.